All good things come to an end. And on what are sure to be emotional evenings, Andris Nelsons has chosen to say farewell to Birmingham with Mahler’s huge, rapturous hymn to nature – both unchanging, and forever renewing. A beautiful new choral work by Andris’s fellow-Latvian Eriks Ešenvalds – jointly commissioned (thanks to support from the Feeney Trust) with Andris’s new orchestra in Boston – brings our orchestra, choruses, audience and conductor together to celebrate seven inspirational years. Andris Nelsons says Birmingham must keep loving the CBSO. Highlights from the other movements were aplenty. The changes of mood in the third movement were brilliantly executed, with the offstage flugelhorn exquisitely lyrical. Mezzo-soprano Michaela Schuster’s performance was perfectly measured and supported by some mellifluous French horn playing. The CBSO Youth and Children’s Choruses were enchanting in the fifth movement, maintaining good balance with the adult chorus and bringing joyous light relief after the profundity of the fourth movement. In the final movement Nelsons, who had conducted with passion and energy throughout and sometimes jumping on the spot, seemed to get renewed strength and there was a palpable response from the musicians as the finale built to its emphatic conclusion.As Nelsons cut the final thunderous chord his arms remained aloft, motionless and statuesque. Two thousand two hundred lungs simultaneously suspended their breath. Not until the sound had completely faded away after a prolonged pause did he move. Only then did the audience exhale, rising spontaneously as one in a standing ovation that went well past the point of hand hurting. … “A hundred minutes is a long time to be on the edge of your seat, but Nelsons kept us there throughout this epic hymn to man and nature. 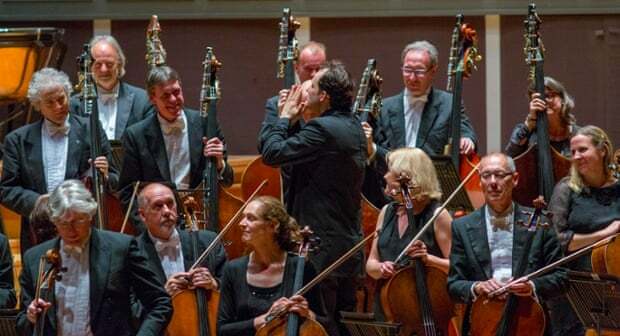 During his time in Birmingham he has made his mark with resplendent Wagner and Strauss, electrifying Beethoven and a shoal of world premieres and recordings. The orchestra, trained for 18 years by Simon Rattle and for a decade by Sakari Oramo, was already on fine form. With Nelsons they have discovered a new freedom of expression. This reflects the qualities of this warm-hearted musician from Riga, not yet 40, who encountered his first opera – Tannhäuser – aged five, cried when the hero died, and decided to become a conductor. The Ešenvalds work, Lakes Awake at Dawn, recalls a dark event in Latvian history – June 1940 – when a mass Soviet deportation to Siberia forced thousands to flee their homes and spend a fearful night in the forest. After an explosive start, the work achieves a radiant calm as dawn arrives. The writing is tonal and ecstatic, immediate in impact rather than radical. Commissioned both by the CBSO and Boston, where it was premiered last year, it was a thoughtful prelude to the Mahler, troubling more for its subject matter than its harmonies. Watch the CBSO’s farewell video. This entry was posted in Andris Nelsons, CBSO, Music and tagged Andris Nelsons, CBSO, CBSO Children's Chorus, CBSO Chorus, CBSO Youth Chorus, Esenvalds, Mahler, Michaela Schuster.